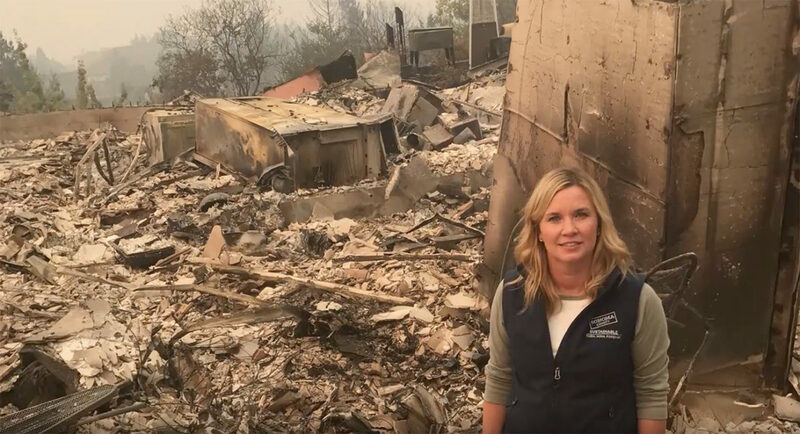 Karissa Kruse of the Sonoma County Wine Growers Association stands at what remains of her home after the wildfires. She appeared on a KRCB radio show that was also filmed for television. KRCB’s radio and television studios are housed in a ramshackle building in Rohnert Park, Calif. We’re just south of the city of Santa Rosa, where several neighborhoods were flattened by the fires this month. Our television signal reaches most of the San Francisco Bay Area, but KRCB’s radio service is concentrated in Sonoma County, the area hardest hit by what have now been recognized as the worst fires in California history. Twenty-two people died in our Sonoma County, and 8,400 structures — homes and businesses — were lost in Sonoma and surrounding counties. As the wind-whipped fires broke out and quickly spread during the night of Oct. 8, our immediate challenge was this: How can we bring to bear our limited resources, in both radio and television, to inform our community about the ongoing danger? What could we do that the local AM station, San Francisco public radio and television outlets, and our local daily newspaper couldn’t? I’m new on the job here, having arrived in mid-June to take over as news director. I’d been tootling along creating daily radio features to tuck into Morning Edition and All Things Considered. We had talked about bringing more local news coverage to our TV station, but we weren’t quite there yet. The wildfire crisis demanded that we get creative and take a completely new approach. In the early days of the fire, we considered setting up a central depot to share stories with public radio stations in the region, but this initiative never quite took off. Instead, we opened our studios for shows from KQED and KALW in San Francisco, so they could take their listeners into the heart of the fire-affected region. As John Sepulvado of KQED’s California Report and Rose Aguilar of KALW’s Your Call finished their own shows in our Studio B, we shepherded them into our on-air Studio A, so that our listeners could hear other voices, especially where those hosts had done some original reporting. One morning I returned the favor as a guest on KQED Forum Friday, hosted in-studio by Mina Kim, bringing a local perspective to their coverage. We soon recognized that we needed to find ways to reach our large Spanish-language community. People listen to our radio and television broadcasts in English, but we feel a responsibility to cover issues in the Latino community, and we’re working to increase our capacity to be more nimble in Spanish. During the fire we reached out to an organization that started a fund to assist undocumented residents who won’t qualify for federal emergency aid if there are no U.S. citizens in their families. We invited Ana Lugo, president of the North Bay Organizing Project, to the radio studio to do a live interview about the new “UndocuFund.” When I interviewed her in our radio studio, we also filmed the conversation. Then we edited the result, and got it ready for TV. I asked Lugo to speak in Spanish about some of the activities she was organizing, and we created a graphic in Spanish with phone numbers and addresses. Baby steps, but we vow to get better at doing bilingual content. From the first day of the fire, our half-time radio reporter Tiffany Camhi was filing both for KQED and for KRCB. She collected voices from a shelter and reported her story as a live two-way to get it on-air more quickly. We went into our television studio to film that debrief, and our producers found a creative way to provide visual interest by putting the words of her interviewees on the screen. For the first four days of the crisis, we ran this report and the other short TV spots as three-minute interstitials during local breaks. Our Morning Edition and ATC host Mark Prell also joined me in the TV studio to give updates on some of the emergency conditions. Mark was an iron man throughout the worst of the fire, arriving at the radio station before 5 a.m., checking on his dad and his home during the middle of the day, then coming back for his afternoon shift. Mark and I conducted dozens of live radio interviews in person and by phone, bringing essential information to our neighbors about evacuations, curfews, fire containment, shelters and the recovery process. He and I had developed an easy conversational rapport as we broke into network programming on the radio. That carried over to our TV reporting, which once again filled into available three-minute spots. 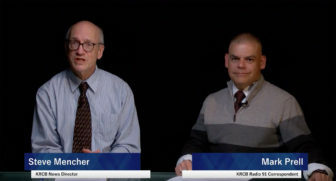 Mencher and Mark Prell, host of NPR’s newsmagazines on KRCB, appeared in short news breaks produced for KRCB-TV. These TV segments were pretty crude, but we do know how to do TV here. And a perfect visual story landed, almost literally, on our doorstep. In the first days of the fire, farm animals were evacuated to a dog training school next to our studio. When we walked outside, we were greeted by horses, sheep and a goat that had been brought to a small enclosure by the school. Our content manager, Darren LaShelle, recognized this as the stuff of a perfect social media post. He filmed the critters with his iPhone, then edited the video at home. He saw Facebook as the natural home of his video, so he added large chunks of text on top of the video, allowing Facebook users to enjoy and share it without turning on the sound. The video soon streaked to 10,000 views. The real star of our social media effort was a video we created at a coastal state park. We heard that people had been streaming to the coast, creating a tent city at our local beach. So we sent a videographer and producer there to capture the story, thinking of it as another three-minute video we could add to our TV breaks. It was just luck that the piece amplified a New York Times feature report on the same park. After we shared our video in the comments section of the Times article, the video gained nearly 30,000 Facebook views. On the same day that one crew was at the beach, I took a video producer and a sound engineer to the county fairgrounds to see the large animals — horses, llamas, cows — that had been evacuated there. We found a woman who had fled Coffey Park, the most heavily burned area of Santa Rosa, and a Swiss woman who’d barely escaped her hillside home with two horses. As we entered the second week of the fires, we made a decision to try our most ambitious coverage yet. We scheduled a half-hour television special for Oct. 20, to follow our broadcast of PBS NewsHour. We already had our feature stories on the coastal evacuation and the fairgrounds in the can, and could produce a nearly live update right before the broadcast. But that left plenty of time to fill. We edited the UndocuFund interview we had done and used the same approach to film a radio interview with Karissa Kruse, president of Sonoma County Winegrowers, and edit it for television. We were already learning about better camera angles in the tiny radio studio. In the time I’ve been at the station, this TV special was the biggest stretch for all of us. Producer Isabel Fischer somehow pulled all the elements together just in time. When we broadcast the special, it was simulcast on our radio station. Did I mention that our main radio transmitter was down during most of the first two weeks of the fire? We’re back up and running now, but we have a fuller appreciation for how people can be reminded to use our mobile app and website to listen to our coverage. Going forward, KRCB has made a commitment that we’re in this for the long haul. We’re seeking funding to bring together coverage on radio, TV, the web and social media as our neighbors recover in Santa Rosa and surrounding communities. We’ve started discussions with KQED, KALW, KZYX in Philo, Capital Public Radio in Sacramento, the Association of Independents in Radio, the National Federation of Community Broadcasters and CPB about how we can work together to cover the recovery here, and also prepare for the next disaster. And now it’s back to the work we started just two days before the fire broke out: crafting a plan for our facility, and news coverage, in an emergency. Now we have a little experience to add to the mix. When the earthquake hits, as it surely will, we’ll be ready. Steve Mencher is news director of KRCB, a public broadcasting service in Sonoma County, Calif., where he joined the staff in June. He was the lead producer for Beyond Belief, the Localore: Finding America project at KCPT in Kansas City, Mo., where his television documentary was nominated for an Emmy. KCSM-TV and joint licensee KRCB are joining under the new umbrella organization.